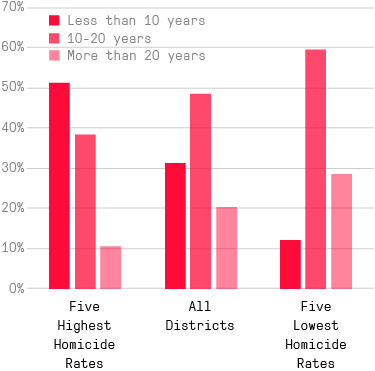 In Chicago and elsewhere, rookies are cannon fodder while vets police the safer neighborhoods. This article is published in partnership with City Bureau, a nonprofit community news service covering Chicago. A lack of experience can also have deadly consequences. Last year, a Buzzfeed News analysis found that younger officers are more likely to use force — a finding also backed by a 2008 study of 186 officer-involved shootings. In Chicago, a database of police shootings compiled by the Chicago Tribune showed that the average officer who opened fire had about nine years of experience, compared to 15 for the department as a whole.